All acreage is approximate, survey to govern. Tract 1 - 10+/- acres (10.0 ac). All tillable tract is next to FS fertilizer location. It is just outside of city limits and has good development potential. Frontage on Gall Rd. Tract 2 - 14+/- acres (14.9 ac). All tillable. Tract is slightly rolling and could be possible residential or road front business property. Just outside of city limits with road frontage on 2 sides of Gall Rd. Tract 3 - 41+/- acres (41.6 ac). This piece has it all. There are multiple possible building sites, with electric and well on property. A creek is part of the south border and a pond is also located on the property. The rolling terrain consists of both tillable and timber to offer some nice walk out possibilities. 27+/- acres (26+/-) tillable on this tract. Tract 4 - 45+/- acres (46.2 ac). Possible building or recreational piece of land. This tract has the most varied topography. Mostly wooded tract will provide some good hunting. Trails are already present. The access to Gall Rd will allow for possible building potential with easy access to Rt 3. 11+/- acres (10+/-) tillable. Legal Description: Part of Sections 22 & 23, Township 2 South, Range 10 West. Registration: Proper and complete registration is required to bid. All bidders must provide name, address, phone number and email address to register. 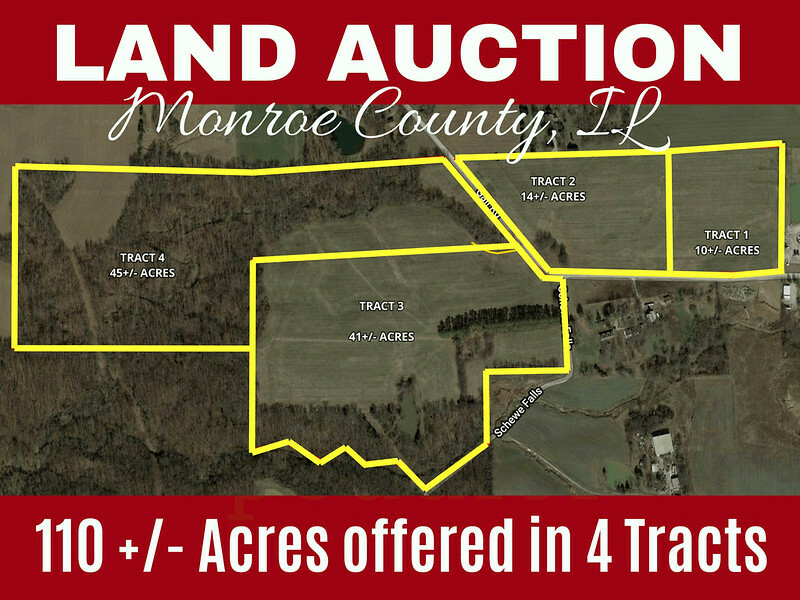 A registered online bidder will then be qualified by the auctioneer to continue; bidder will be asked for a copy of state-issued ID and must be at least 18 years of age. Credit card verification is required to bid online. The credit card will be validated before bidding access is granted, but is not a recognized form of payment of the deposit or purchase price. Deposit must be wired by the close of business next day. Credit card will not be charged unless Winning Bidder fails to complete the contract signing process and required wiring, then $1000 will be charged to the credit card provided at registration. By registering, all bidders acknowledge having read and agree to be bound by the Auction Terms and Conditions. Auctioneer reserves the right to refuse to register or admit Buyer at his/her sole discretion. Online bidders must be verified 24 hours in advance of the live auction. Buyer should register as early as possible to obtain information about the properties and increase the likelihood of being notified of any pertinent changes that take place before the auction. Contract: Winning bidder will sign in person or electronically the auction sales contract immediately after the sale. Earnest Money: Within 24 hours of close of bidding, the approved high bidder will deposit a non-refundable payment of 10% down - deposited with Columbia Title Company. Any stop payment order of a check, or giving a check, which is returned marked “insufficient funds,” shall be deemed by the parties to be evidence of fraud existing at the time the transaction was consummated and shall be construed by the parties as intent to defraud. Taxes: 2018 taxes will be credited by the seller at closing, estimated on current tax figures available from the county. Buyer will be responsible for taxes for 2019 and on. Farm Lease: No current farm lease. Possession at closing. Financing: Your bidding is not conditional on financing, make arrangements before bidding. Survey: Survey will be finalized before closing. DISCLAIMER AND ABSENCE OF WARRANTIES: Subject to prior sale. Subject to all easements, covenants, and restrictions on record. All information contained herein, and all related materials are subject to the terms and conditions outlined in the agreement to purchase. The property is being sold on an “AS IS, WHERE IS” basis, and no warranty or representation, either expressed or implied, concerning the property is made by the Seller(s) or the auction company. Each potential bidder is responsible for conducting his or her independent inspections, investigations, inquiries and due diligence concerning the property. The figures, estimates, and drawings of acreages and boundary lines in the printed material or on the website are approximate and are not guaranteed. The information provided here is believed to be accurate but is subject to verification by all parties relying on it. The Seller(s) or the auction company or their agents assume no liability for its accuracy, errors or omissions.It is the responsibility of each bidder to make sure that the Auctioneer is aware of his or her intent to place a bid. Auctioneer disclaims any liability for damages, whether direct, indirect, consequential, or incidental, resulting from bids not spotted, executed, or accepted. Bidders should also be careful to bid on the correct item and ensure that his/her bid is for the amount intended. Auctioneer is not responsible for errors in bidding, and Buyer hereby releases the Auctioneer and waives any claims for bidding errors. The sale is complete when the Auctioneer so announces in a customary manner. The auctioneer is not responsible for errors in the internet connection or the functioning of the computer system at that time.Conduct at the auction and increments of bidding are at the direction and discretion of the Auctioneer. The seller and auction company reserve the right to disqualify or refuse any bid from the person if there is any question as to the person’s credentials, fitness, etc. All decisions of the Auctioneer are final, and all announcements made the day of the sale by the Auctioneer will take precedence over printed or spoken information made prior. Auctioneer has the right to cancel the sale. Auction Company reserves the right to bid. Property Peddler Inc. and their agents work for the Seller. From IL State Route 3 in Waterloo head west on RR1 (Gall Rd). In half a mile, property is on the right. Continue around the bend in Gall Road and property is also on the left.